The competition started at 2 p.m., but the skaters couldn’t wait and started to flood the courses as early as 11 a.m. to get their grind on. Nine skateboard companies came out to Dew Tour Long Beach to take on the newly created Team Challenge presented by TransWorld SKATEboarding, and with a different rider assigned to each of the four courses the atmosphere around the sidelines was complete with fans as well as the professionals hyping up their homeys. The four days leading up to Sunday’s Team Challenge each team was allowed to get out on the course and as the week progressed a few strategic changes were made—such as Louie Lopez switching to gaps to allow his teammate Luan Oliveira take on the tech, but in the end all that mattered was what went down in the heats. The first guy out to get his practice on was Scott Decenzo from Plan B putting in work on the tech course while his teammate Jagger Eaton got things going on the rails. In the bowl it was Trey Wood for bLind Skateboards getting his legs warmed first, but Plan B’s Ryan Sheckler quickly joined in on the warmup. On the gaps course Zack Wallin from enjoi started snapping his initial ollies, but before long he was joined by a few others and the session was on. 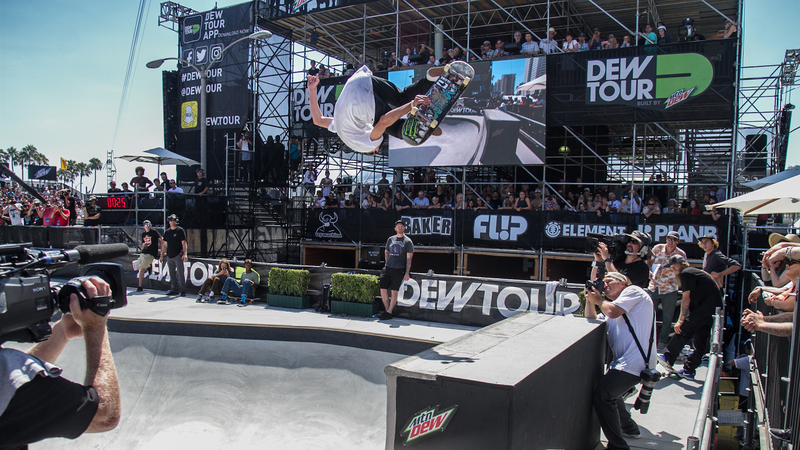 The complete list of teams tasked to take on the reimagined Dew Tour Team Challenge were Baker, Birdhouse, Toy Machine, REAL, bLind, enjoi, FL!P, Plan B and Element. The format for the each course would allow for three heats of three skaters riding in an organized jam format for five minutes. Skaters were able to make a single pass through the course, or a maximum of 25-seconds in the bowl, but if a skater fell during their turn the next in line was free to begin. Starting off the Team Challenge was the tech section. With bLind, Element, and FL!P in heat number one the crowds were treated to both technical and creative skating. Luan came in hot for FL!P and immediately threw down a switch tailslide 270 out on one of the C-ledges. 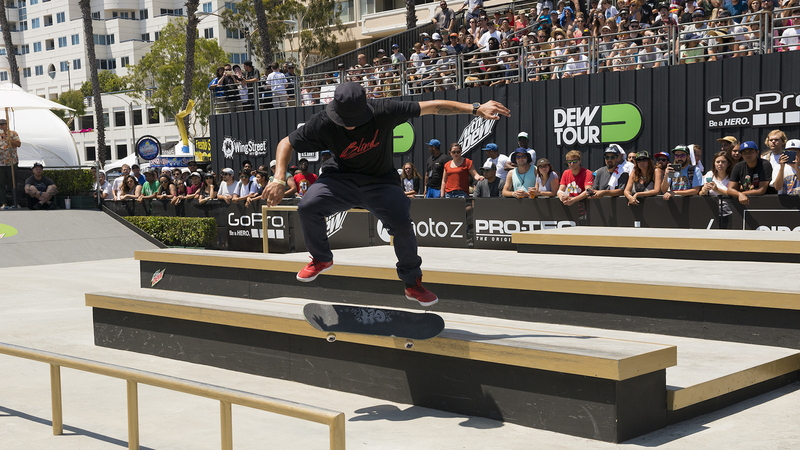 Later Luan landed a switch heelflip manual across the pad. Evan Smith represented for Element and did so with his signature creative style. Evan pulled off a 360 flip nose manual across the pad to nollie 180 to set the tone for technicality, and then he showed off his creativity by taking an ollie up the step-up then gapping way out over the manual pad to a quick manual across the flat ledge. After time, however, Evan pulled off one more original move, but first he plucked a rose from one of the bushes lining the course. With rose in hand, Evan kickflipped up the step-up and into a 50-50 across all of ledge island before taking an ollie into the opposite step-down. Evan proceeded to the railing where awarded a female fan the rose and leaned over for her to kiss his cheek. Another after time trick came from TJ Rogers. With a kickflip up the step-up and across ledge island, TJ kept his manual going down the island, across the flat, around the bank and then all the way down to the end of the flat ledge where he ollied out of it and into a noseslide 270 shuv out. The crowd approved. before time ran out TJ also nailed a nollie kickflip noseslide 270 shuv out on the flat ledge. Heat 1 definitely started the Team Challenge right and proved to be the most impressive for the tech section, and ultimately TJ Rogers would earn the top score from the course. Other noteworthy tricks from the tech section came from Clint Walker riding for Birdhouse when he pulled a crooked grind across the flat rail and landed into a nose manual that he took all the way across the flats and up the bank. Another was when Plan B’s Scott Decenzo nailed a perfect nollie kickflip crooked grind to nollie kickflip out on a C-ledge in addition to a switch kickflip backside tailslide and a kickflip backside smith grind. As the crowds settled into the next grandstands in front of the bowl, Ben Raybourn began dropping in and blowing minds immediately for Birdhouse in Heat 1. Raybourn is known for his inventive tricks and crazy style, and the sweeper variation from the top of the bank wall that had him letting go of the board on top of his front foot before yanking it out and free falling in reminded everyone what he had to offer. Another crazy trick was his burntwist, or eggplant revert, on top of the pool coping extension. Heat 2 may have been the craziest from the bowl section. Trey Wood from bLind pulling off big tricks like kickflip stalefish over the channel gap and a massive 540 out of the pool coping extension. Then there was Element’s Greyson Fletcher who showcased his casual freeform style that always unfolds with surprises. Greyson’s highlights included a frontside air to smith bash on the pool coping, a crazy frontside blunt stall above the channel gap window that forced him to jump back over the window to get in, a huge straight legged frontside air, and his signature ollie north, or one foot, over the hip. Curren Caples also skated in that heat for FL!P and pulled off a number of tricks where he stepped up into grinds from the lower section and then pulled in over the channel gap window like frontside smith and nosegrind. He also managed a frontside blunt stall on the pool coping and a backside noseblunt stall on the banked wall. Curren would end up with the highest score from the bowl section. Moving on to the rails course, heats 2 and 3 showcased the craziest tricks. In Heat 2 there was Tre Williams skating as a last minute replacement for Leo Romero on Baker Skateboards. Tre had already skated the tech course for Baker, but when asked if he could skate the rails as well he was actually excited. Tre nailed a frontside bluntslide, noseblunt, and nollie backside 50-50 on the 9-stair handrail and a nollie frontside crooked grind on the 6-stair handrail. Heat 3 was a stacked heat with Nyjah Huston riding for Element, FL!P’s Alec Majerus and Micky Papa throwing down for bLind. Everyone unloaded. Micky landed nollie frontside crooked, cab 270 to frontside boardslide, and a backside 180 nosegrind on the 6-stair handrail plus a picture perfect backside nosegrind down the 9-stair handrail. Micky earned the best score from the rails course. As for Nyjah and Alec, they seemed to be having the most fun on the LFR (Long Freaking Rail). Nyjah pulled a 5-0 across and down as well as a backside smith pop-out, while Alec went got a frontside feeble across and down one direction and across and off the tall drop going the other way. Nyjah also nailed a gnarly switch frontside noseblunt down the 9-stair handrail. The final section of the day was the gaps, and by this point bLind was on top of the leaderboard with Element, FL!P, and Plan B all within reach of taking the win. Birdhouse’s Aaron Homoki, a.k.a. Jaws, may have put on the best show in this section. Jaws did not earn the highest score for the course as a whole, but between his massive ollie off of the bank at the far end of the course and then over the deck and guard rail to land in the parking lot, both of his kickflip and frontside flip to melon grabs off the wedge and down the tallest gap—Jaws was a crowd favorite and had the grandstands erupting throughout Heat 2. 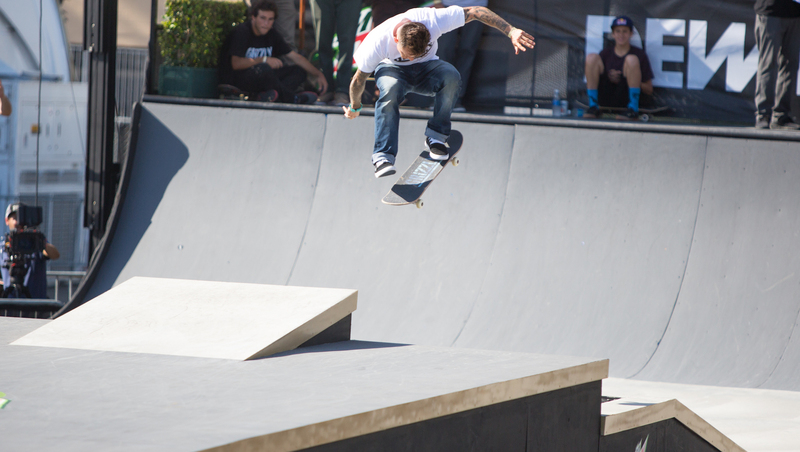 Also in Heat 2, Chris Joslin from Plan B fired off heavy tricks like a backside 360 off the wedge and down the tallest gap in addition the kickflip and frontside flips he took from one of the bumps to the flats off the course entirely. Joslin would be awarded the top score from the gaps section. 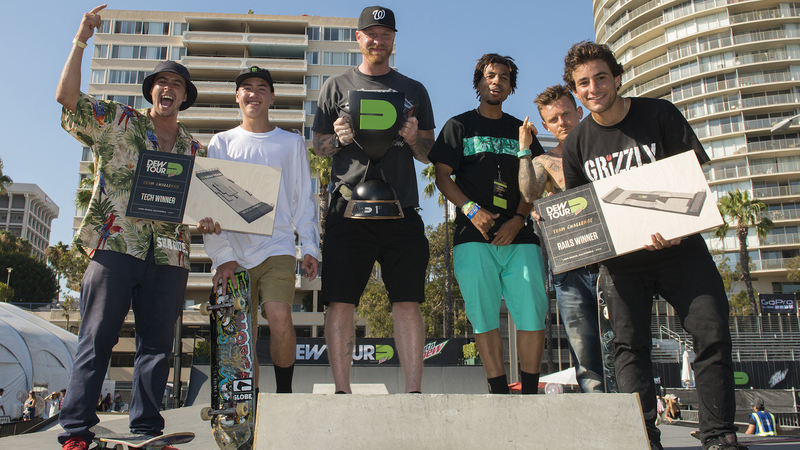 After Heat 3 in the Gaps it was made official, bLind Skateboards had won it all! With Cody McEntire locking in the points necessary in Heat 3 of gaps with flawless switch kickflip and switch heelflip down the grass gap, the team had more than enough points to secure the win.